"Father Luigi Villa was right!" After the visit of Pope John Paul II in Brescia, September 20, 1998 , for the beatification of Joseph Tovini, Don Luigi Villa wrote an article in "Chiesa viva"
n. 301, December, 1998 on the topic of this crucifix of Cevo. This occasion occurred six months after the publication of the first book by Don Villa : " Paul VI beatified? " This crucifix which bears Christ in such a horrid overhanging position rises from a fire of sculpted metal. The crucifixes arches not towards heaven, but falls back arching toward the earth ... " On that occasion, Pope John Paul II made ​​a speech in which he took for granted the beatification and canonization of Pope Paul VI . This Crucifix, from that day on, became the symbol of the intention and determination of the high ecclesiastical hierarchy to put Paul VI on the altars . Read below a secular media version of the story as well. 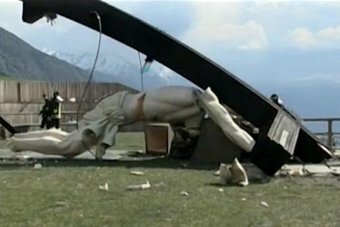 An Italian man has been crushed to death by a giant crucifix honouring John Paul II that collapsed during a ceremony ahead of the late pope's canonization. "It is an inexplicable tragedy. A young life, so many hopes, destroyed this way," Cevo Mayor, Silvio Citroni said. "The boys ran in every direction when they heard the sound of the wood splintering," he said. "Unfortunately, that poor boy went the wrong way." Further celebrations to mark the pope's elevation to sainthood have been cancelled. According to the Corriere della Sera newspaper, Mr Gusmini lived with his family on a street named after John XXIII. The Jesus Christ statue on the cross is six meters high and weighs 600 kilograms. The crucifix was curved and fixed to the ground with cables. Its unusual shape was intended to represent the scars of World War II. The cross was designed by sculptor Enrico Job and was created for John Paul II's visit to Brescia in the Lombardy region in northern Italy in 1998. "The news has really shaken me. My thoughts go to the poor boy and his family," Mr Job's widow, film director Lina Wertmuller, told Ansa news agency. "That cross was a great symbol for Italy, a symbol of protection. But all that seems silly in the face of this terrible tragedy," she said. English - "Crucifix of Cevo"
Italian - "Crucifix of Cevo"